Royal Raymond Rife and Antoine Prioré are two names from the past, steeped in mystery, folklore, truths, half-truths, and inaccuracies. Both the inventors, and the development of their inventions, were sponsored and financed by elite financial interests. These sponsors included; the Premier of France, who opened Prioré's research facility, and the Timken roller bearing family members, who financed Rife. Both the Rife machine, Rife microscope and the Prioré machine appeared to have stunningly successful results. It was not fully understood how or why they accomplished such results till now. What were the electro-magnetic principles of the machines that they so famously built? Why have so many so-called replications failed or fallen short? 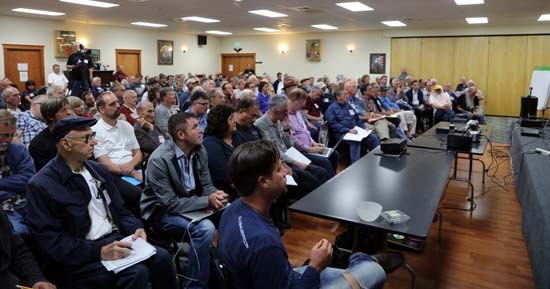 After over three decades of research, John Bedini answers all these questions, and more, in this newly released DVD and booklet. In the beginning of this book, Bedini walks us through his initial introduction and instruction in the Rife technologies. John goes through both the deliberate and often inadvertent obfuscation of what Rife's frequencies were, and how they were propagated. 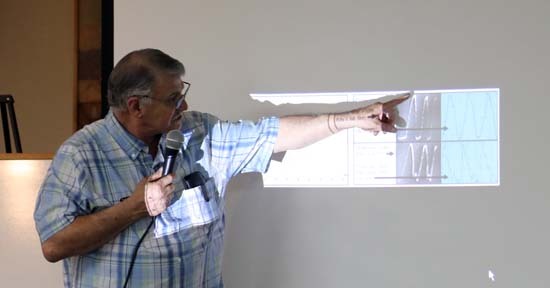 His circuits, charts and notes are shared with readers and spectators as he lays out in meticulous detail what Rife and Prioré accomplished in the past. John Bedni has finally solved the puzzle. The book and DVD also discusses John's explanation of the fresh wrinkles that Prioré independently added to the Rife methodology. He brilliantly adds a new layer to the whole process that not only eliminates many of the past inaccuracies, but also locks down an entirely new paradigm for successful application in the field. And we get to look over his shoulder as he shows on the Spectrum Analyzer and on the bench exactly what he is doing, and why. Plus we get an explanation of John's new invention that elegantly incorporates all of his research in this area. 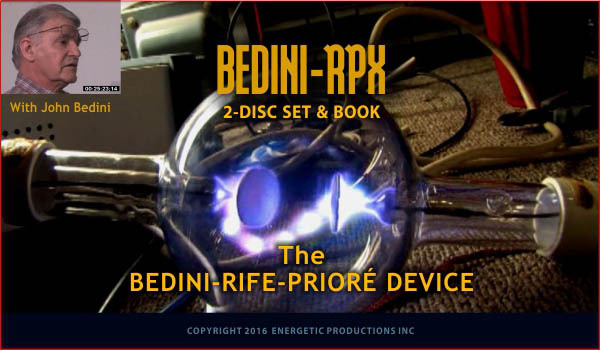 The book and DVD combination (only sold together) can be purchased from this page, and for those with adequate knowledge, training and skills on the bench, the Bedini RPX can be built from the information in the DVDs and the booklet. THE SIDEBAND GENERATOR AVAILABLE AT SIDEBANDGENERATOR.COM IS USING A MORE ADVANCED CIRCUIT THAN THE ONE IN THE BOOK BUT IT STILL WORKS. The two DVD set alone runs over three and a half hours. Are these the same book and DVD's that were prerecorded and available for sale at the conference by Tony Craddock? Or are these new ones of John's actual presentation at the conference? This is the same set that was released at the conference. I don't know if John's presentation at the conference will be released. Although we have a NO REFUND policy for these units, we are now offering a 1 year guarantee! If your unit stops working within one year from the time you receive it, just send it back to us and if we can't fix it, we will send you a new replacement unit. Our new RPX Sideband Generators are built right here in Spokane, Washington, USA and are assembled by a professional company that specializes in surface mount circuits. The quality and workmanship is guaranteed per the new 1 year guarantee above. Yes, we understand that other countries manufacture fine quality products too, but we're choosing to support a local company that is right here in Spokane, Washington, which employees people right here. Instead of having to sign a buyer's agreement and send it to us by mail like before, you can simply read the buyer's agreement on our website. You can simply agree by clicking the buy button at the bottom, which means you automatically agree. Simple! We no longer only accept checks, money orders or Western Union payments. Simply make your purchase with PayPal! If you wish to send us payment by other means, you can do that too. VELLEMAN HPG1 POCKET FUNCTION GENERATORS AVAILABLE HERE & WE WILL PRE-PROGRAM THEM FOR YOU FOR THE RPX SIDEBAND GENERATORS! We are now distributing the Velleman HPG1, which is your most economical option for a function generator that must be used with the RPX Sideband Generator. We will even program it for you! All you have to do is hook it up and turn it on - simple! This is only available in the combo package. You can now get the RPX Sideband Generator in a package together with the Velleman Function Generator, Talentcell Battery and the required cables all in one purchase! The only think you have to do is strip the ends of the cables on the banana plugs and connect them to your own electrodes, pancake coil or whatever method you want to use to transmit the output of the RPX Sideband Generator. This will save you a lot of time and effort by getting everything in one single purchase. Both of your orders were placed on April 21st and were already shipped to you. Shipping information was also provided to you by email. Please contact Jeff at help at emediapress dot com to verify tracking information. We apologize if there is a shipping delay, but it is most likely customs holding it up in your country. i have contacted Jeff before post this ,he told that he didnt know when it would be sent. I'm sitting here with Jeff right now and am looking at the order status and both of your orders have already been shipped over a week ago. You already asked Jeff about this and we verified that the USPS tracking number was sent to you. Even if we ship it overnight to China, the Chinese Customs can hold it up for a couple weeks and that is beyond our control. In any case, your order was already shipped over a week ago. You can check the USPS website to verify the tracking number to see what the status is. If it says it has arrived at your location, then your postal customs office is holding on to it. Please contact Jeff by email if you need help looking up your shipping status. Ok, that is for the book/dvd set. I apologize, for some reason I thought you were talking about the RPX unit/combo and not the book/dvd. Our shipment will be sent to us next Monday. We do not publish these ourselves and have run the publisher out of inventory before. Please contact Jeff for details and make sure to mention you are asking about the book/dvd set.